Sing in the Sweet Adeline style with these close harmony arrangements in the barbershop style which are suitable for both beginning and experienced quartets and choruses. 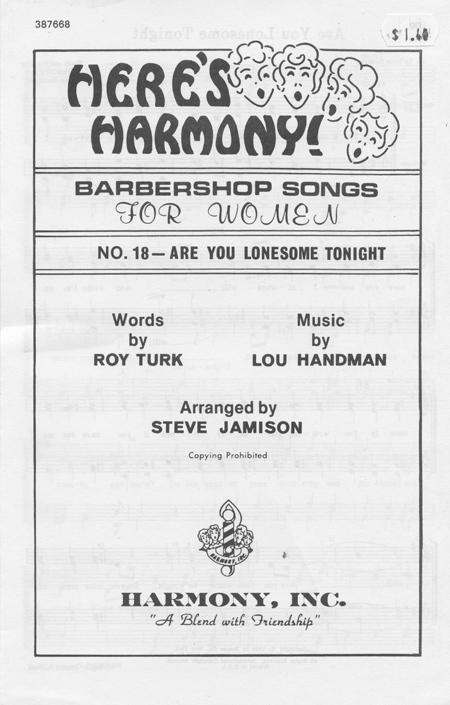 'Ladies Barbershop Book' offers unaccompanied arrangements of a variety of well-loved songs, from the 1920's to the 1970's. Performances should work equally well with choirs or just four voices. 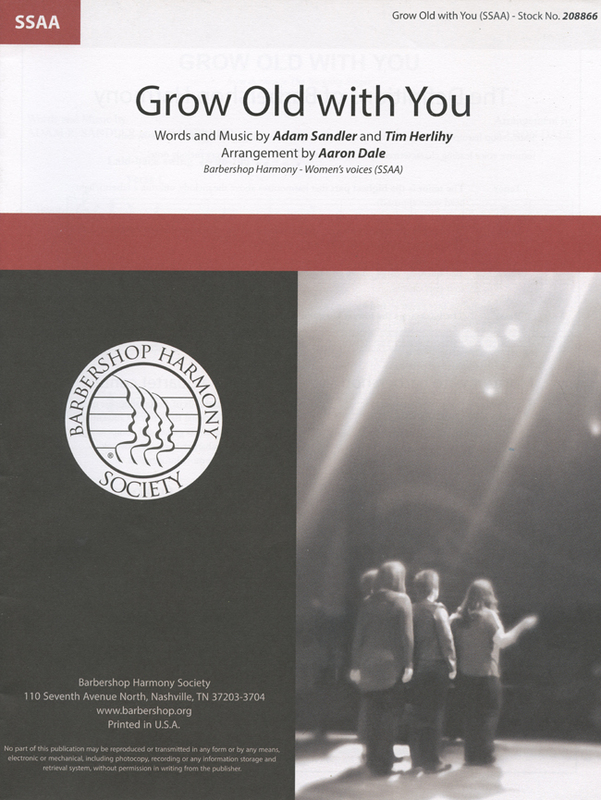 Arranged by Nicholas Hare for SSAA. Helpful performance notes are included for each of the songs, and the arrangements are notated on two staves for easy piano rehearsal. Meet Me in the Lobby is a delightful collection of short, easy-to-follow arrangements - perfect for Sweet Adelines at all levels. The songs are familiar old standards which epitomize the barbershop style. Great barbershop tunes like Amazing Grace, Auld Lang Syne, Let Me Call You Sweetheart and Take Me Out To The Ball Game, along with a collection of popular tags, give all those regional weekend late night die-hards a quick choice of repertoire. Meet Me in the Lobby is a great source for pick-up quartets, tag quartetting, warm-up songs, audience sing-alongs, woodshedding practice and much more. Some of the most accomplished arrangers of 4 part barbershop ladies voices have contributed to this fine collection. We carry the very popular Close Harmony For Men sheet music series and now we offer the best of that series in ssaa arrangements. This collection of popular songs are arranged by some of the top close harmony arrangers in the business and are suitable for quartets of all abilities. Lots of fun here! A great collection of arrangements of classics. A wonderful collection of songs arranged by some of the best in the field. Energetic, rhythmic, and a joy to sing, Alex Morris has all the right ingredients in his arrangement of this beloved 1980s classic. Whether performing a cappella or with a percussionist or two, this arrangement is sure to be an audience favorite. Steve Jamison : Are You Lonesome Tonight? The song was written in 1926 by vaudevillians Lou Handman and Roy Turk with three verses, followed by a spoken bridge. In April 1960, after Elvis Presley's two-year service in the United States Army, he recorded the song at the suggestion of manager Colonel Tom Parker; "Are You Lonesome Tonight?" was Parker's wife, Marie Mott's, favorite song. This marvelous song from Disney's Beauty and the Beast is a delight and this arrangement from Steve Delehanty is a winner. This is the female quartet version. Aaron Dale : Can't Stop the Feeling! Catchy, infectious, and downright fun to sing, this 2016 smash hit by Justin Timberlake, featured in the DreamWorks Animation film Trolls, is a must-have for your quartet or chorus repertoire. Aaron Dale delivers an accessible arrangement, suitable for any strong ead or Lead section, that stays true to the original and will bring your audiences to their feet, singing and clapping along! Originally recorded by Eric Clapton and produced by Kenneth Babyface Edmonds for the soundtrack of the 1996 film Phenomenon, this brand new arrangement from the powerhouse arranging team of Deke Sharon and David Wright breathes new life into this pop classic. This song was a hit single from singer-songwriter Rachel Platten's debut album on Columbia Records. Both male and female arrangements of this pop classic are available. This 1967 hit by the Turtles has become a vocal harmony favorite and this arrangement will indeed make your quartet be happy together. This is the female quartet arrangement. The 1968 B.J. Thomas hit achieved new life in 1974 when the Swedish pop group Blue Swede covered the song adding the now-familiar "ooga-chaka" lyric. Appearing in numerous commercials, movies and television shows, the iconic song resurfaced again in the blockbuster film "Guardians of the Galaxy." 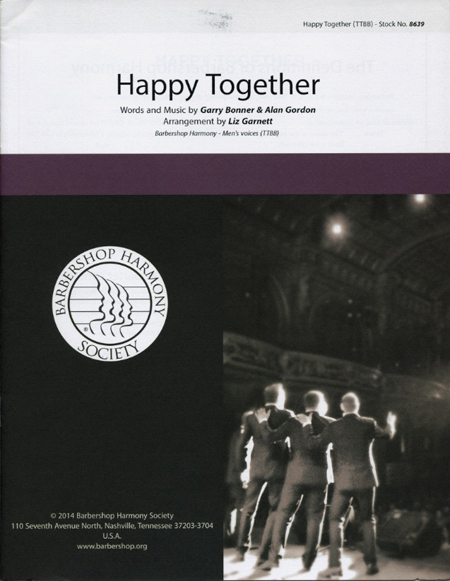 This playful four-part a cappella arrangement from the Barbershop Harmony society is available in voicings for any ensemble - TTBB, SSAA or SATB. Recorded by Bing Crosby in 1931, I'm Thru with Love quickly became a jazz pop standard that was featured in films and covered by such notable artists as Marilyn Monroe, Nat King Cole, Etta Jones and many others. This beautiful a cappella barbershop arrangement is available in both men's and women's editions and features classic harmony with tons of gorgeous major seventh chords. You'll have 4-part a cappella harmony fun with this barbershop arrangement of the Beach Boys classic song! Featured in films and covered by such notable artists as Doris Day, Frank Sinatra and Dave Brubeck, Rodgers and Hart's 1935 hit has become one of the most beloved standards of all time. This beautifully crafted a cappella barbershop arrangement is available in men's and women's editions. It features a refined, elegant setting that is both accessible and emotional. 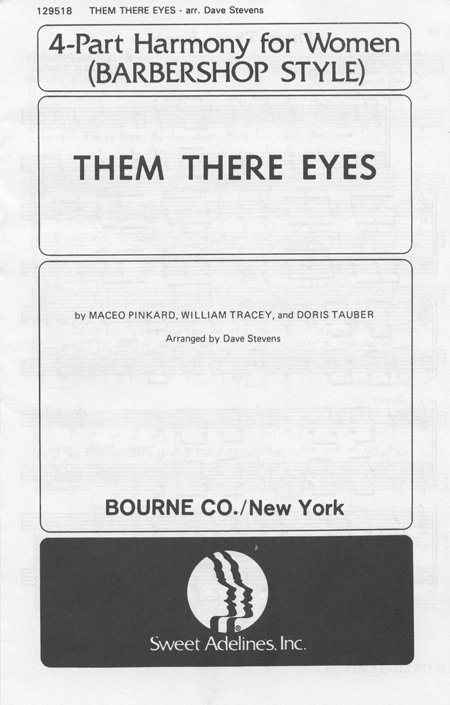 "Them There Eyes" is a jazz standard first published in 1930. One of the early recorded versions was performed by Louis Armstrong in 1931 and It was made famous by Billie Holiday,). 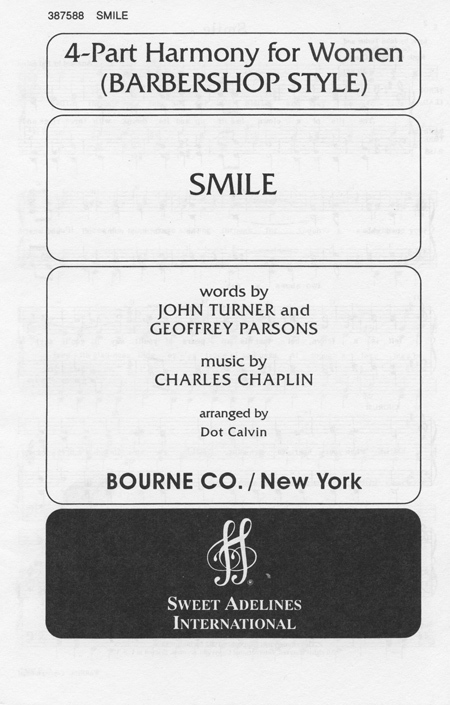 "Smile" has become a popular standard since its original use in Chaplin's film "Modern Times". Its timeless theme will be pleasing us for generations to come and a wonderful addition to any quartet's repertoire. A tribute to "female power," this KT Tunstall hit was featured in the film "The Devil Wears Prada" and countless other TV shows, films and video games. This bluesy country hybrid has been distilled into a four-part a cappella arrangement in the classic barbershop style for Sweet Adelines and women's ensembles. 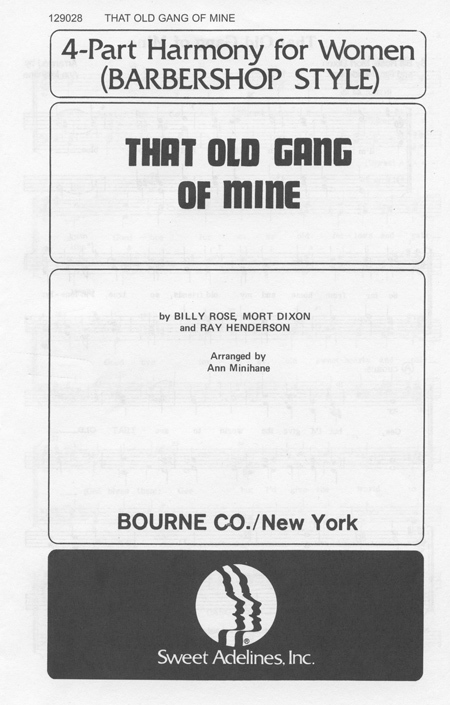 "That Old Gang of Mine" is a 1923 popular song composed by Ray Henderson with lyrics by Billy Rose and Mort Dixon, and published by Irving Berlin, Inc. It was introduced in the Ziegfeld Follies of 1923 by the vaudeville duo Van and Schenk. The song became a million-seller. This brand new offering from master arranger Kirby Shaw combines the romantic lyric and thoughtfully crafted and singable melody with the arranger's own signature treatment. The result is a stellar chart featuring a strong lead part that stays true to the original 2015 smash hit. Wow. Two of a cappella's most highly acclaimed arrangers collaborate on this stunning arrangement of vocal pop sensation Sia's hit song. This is an arrangement that should be in every quartet's repertoire. The great Irving Gordan song was made famous by Nat Cole and his daughter Natalie Cole and is surely one of the great American standards. 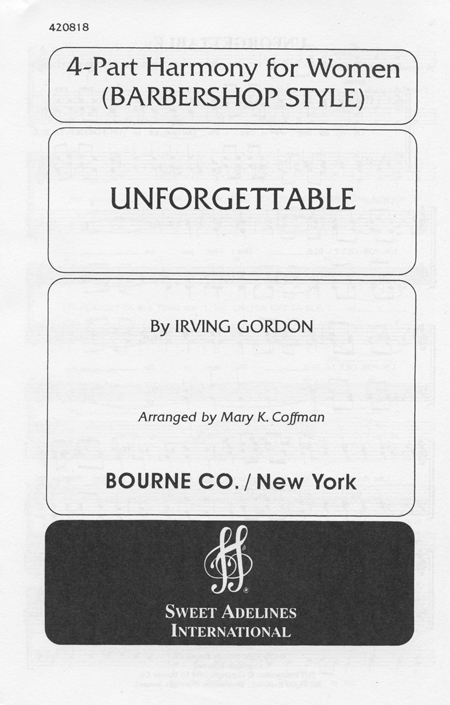 Mary Coffman does her magic here to create an arrangement that;s fun to sing.